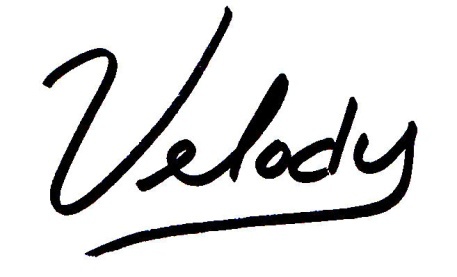 Hello my name is Velody and I’m a Craftaholic. Yes yes I admit it. 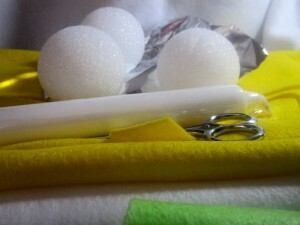 I love to do seasonally themed items; especially ones that are simple, lower cost and can be done as a family activity. I had to rack my head a bit thinking about Imbolc and the early part of spring. This is a time of year where I’m out of sync with a lot of the county. I live in Florida so we’ve already left winter completely and are now moving back into Spring temperatures. I asked my peeps on Google + and on Facebook what they associated with Imbolc. I was flooded with many ideas after that. 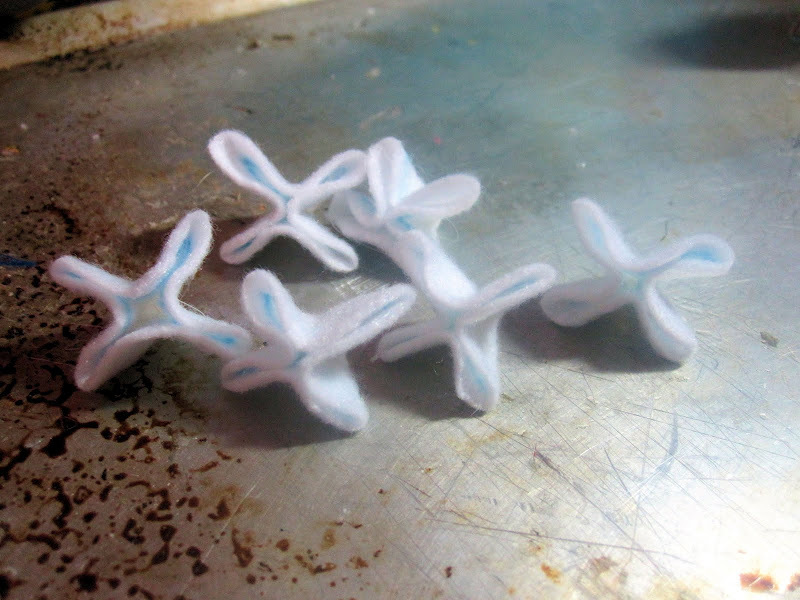 The idea of white flowers stuck with me and I just couldn’t shake it. I love to work with felt. It’s a very forgiving material, can be inexpensive, and is great for people of all skill levels. What else do we all love? 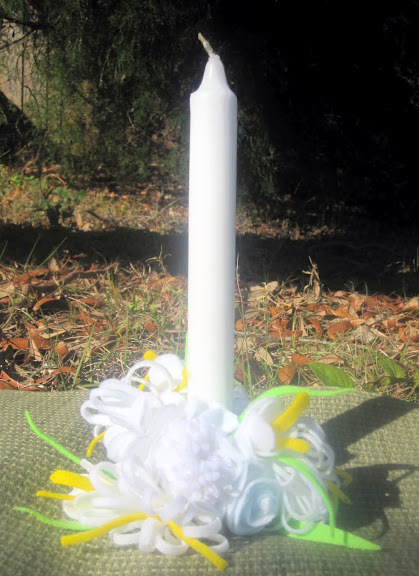 Something pretty to sit on the table or our altars. 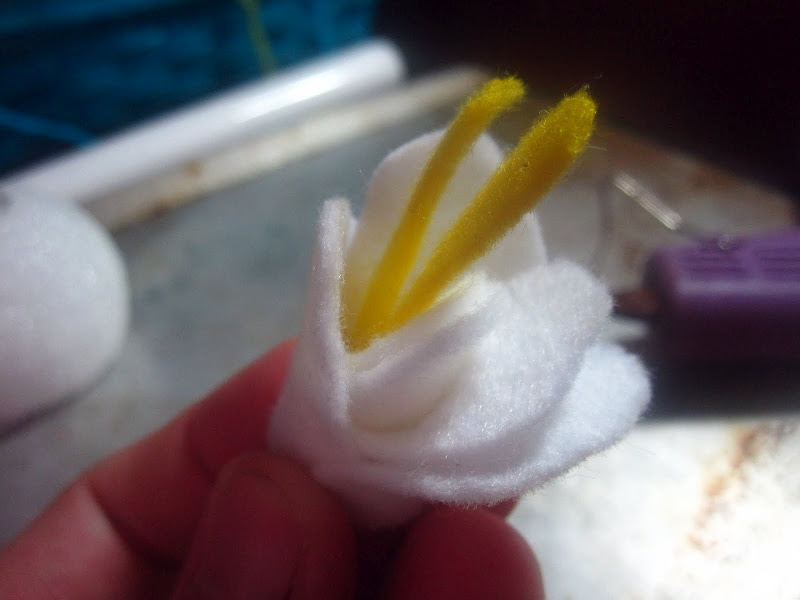 The result of all this pondering is that today I bring you a simple felt flower candle holder. Warning: Do not leave candles unattended. 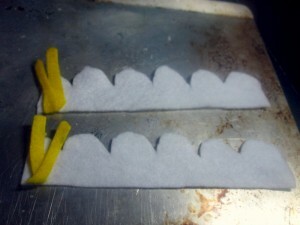 Styrofoam melts when hot and felt will smolder. This is for decoration or short periods of time under supervision only. At its core this is a Styrofoam ball covered in felt flowers with a place to stick the candle. 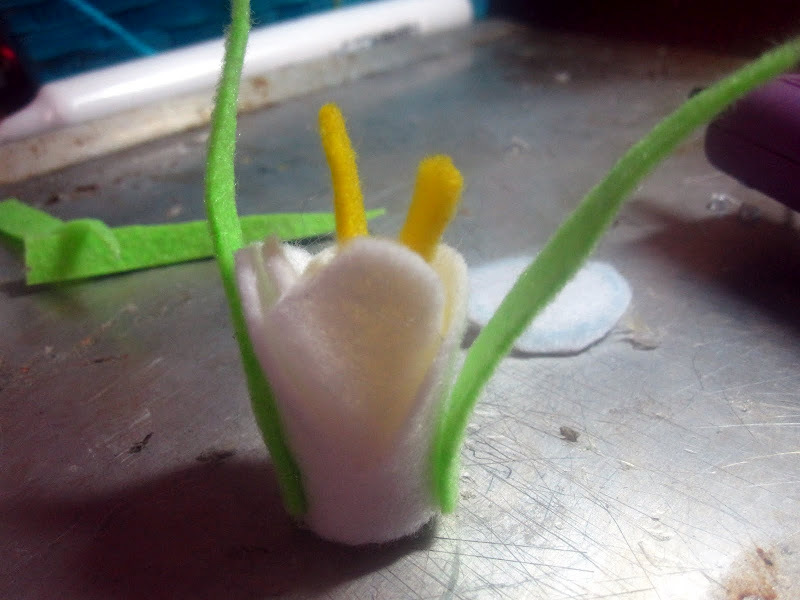 I did 6 different types of flowers and I’ll show you each one. Not all of them are original to me. I promise to show you my inspiration. First I cut off the bottom of the Styrofoam ball so I had a solid base. I then used the tip of my scissors to carve out the hole for the candle. 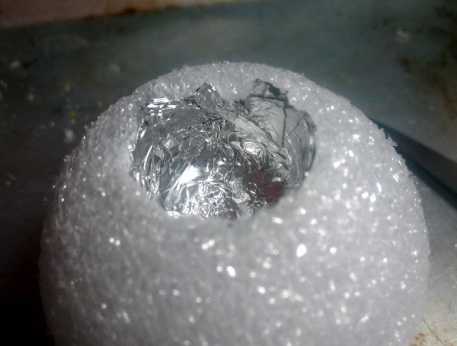 I inserted a small piece of aluminum foil into the bottom. This helps to keep the candle nice and tight. I now have the base to attach all of my flowers to. The first flower is an Iris like flower. I adapted this idea for Cherry Blossom flowers by Creative Jewish Mom. 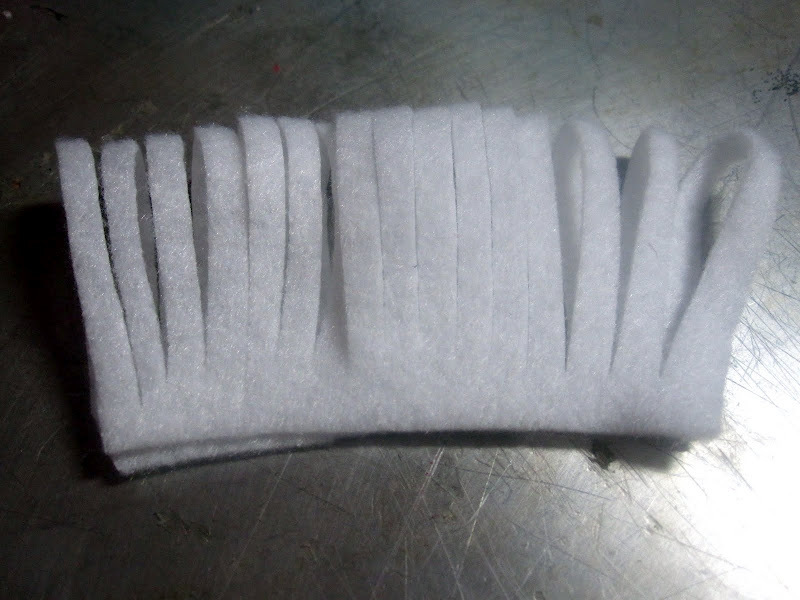 I started with a strip of 1 1/2” x 6” white felt. 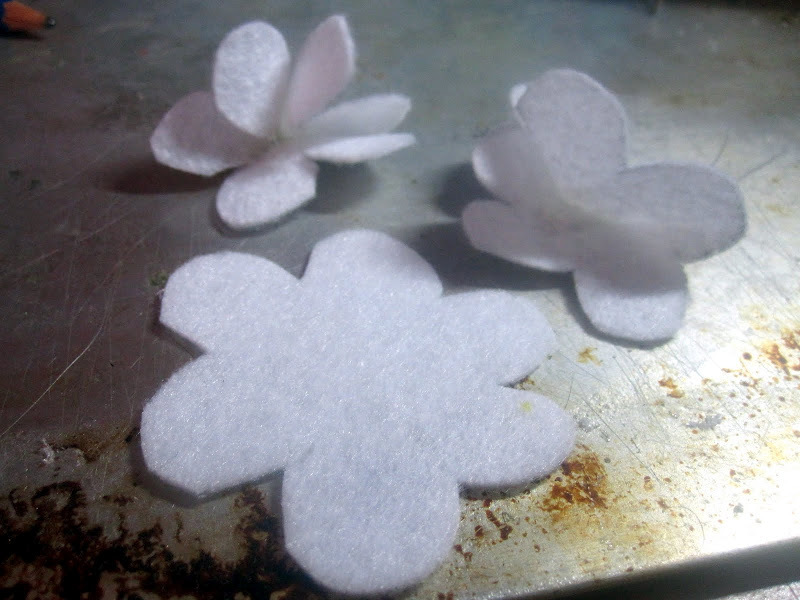 I scalloped the edges to make the petals. Not shown in this picture (but it is in the following one) is I found I needed to make the down cuts larger. Only a 1/4” from the edge. 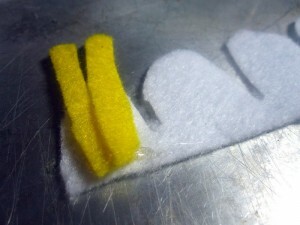 I cut 2 thin pieces of yellow felt about 2 inches long and first glued them to the far left. 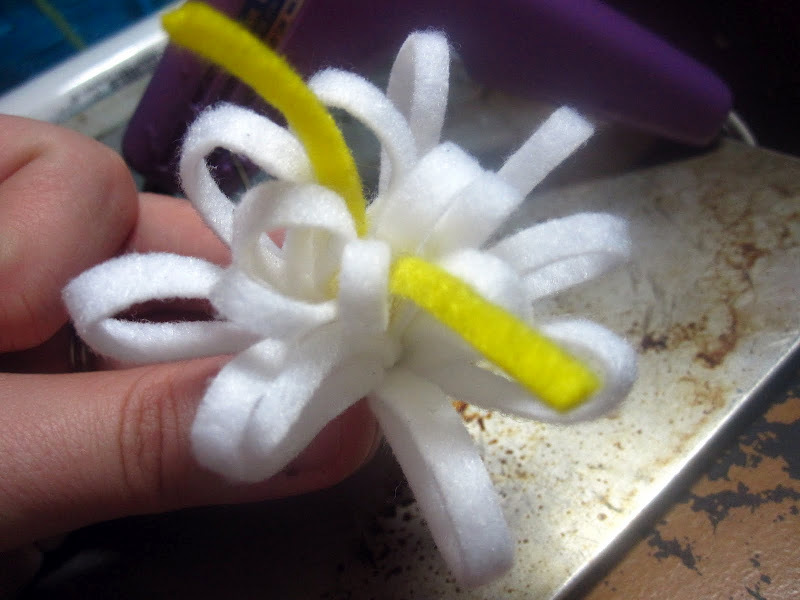 I then rolled the piece up using hot glue as I went. I pulled down the exterior petals a bit to shape the flower. I also cut two thin green pieces of felt and added them to the sides. This flower was also inspired by the Creative Jewish Mom. First cut out three flower like shapes. One larger than the other two. 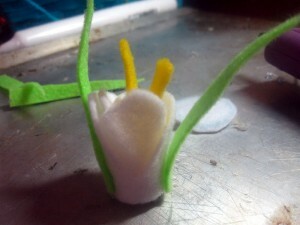 For the two smaller shapes add a bit of hot glue to the center and squish the flower together a little. 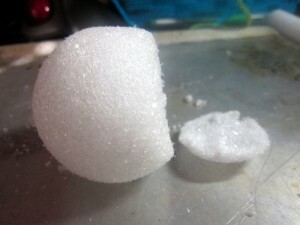 Now add a large bead of hot glue to the center of the large shape and stick the two squished ones into it. Arrange so it until it looks nice. This flower is entirely of my own thought. I took a piece of 6” x 4” white felt and folded it in half. 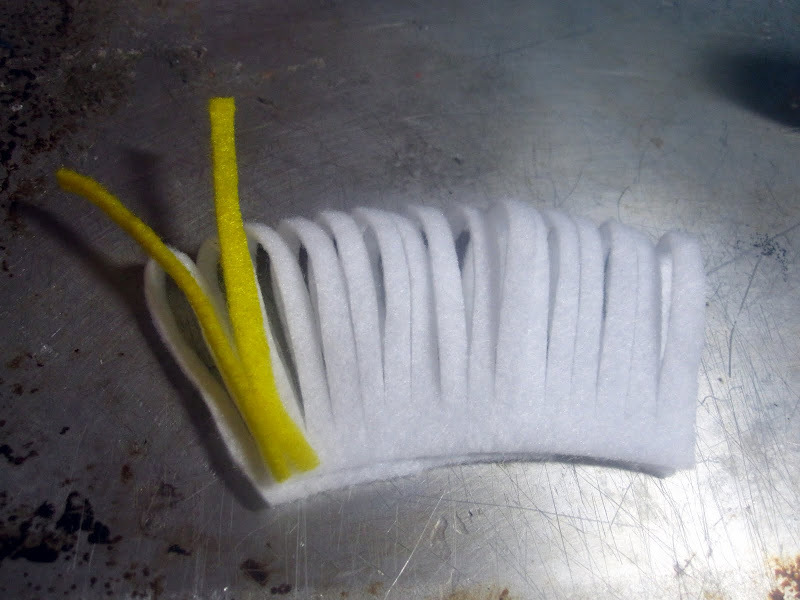 I cut from the fold towards the end in small slits making sure to leave about a 1/2” inch uncut. I cut two thin pieces of yellow about 3” long. 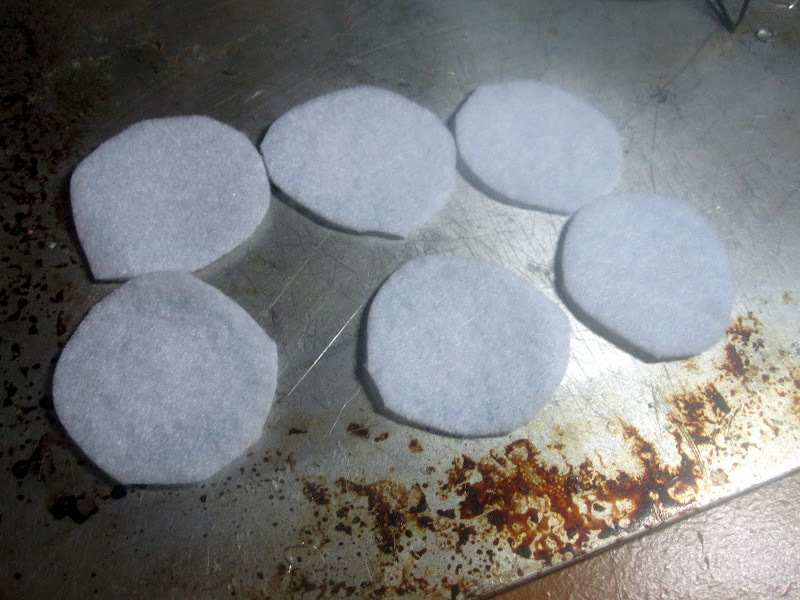 Now I added some hot glue between the two pieces of felt at the bottom for stability then rolled it from left to right adding hot glue along the bottom edge as I went. 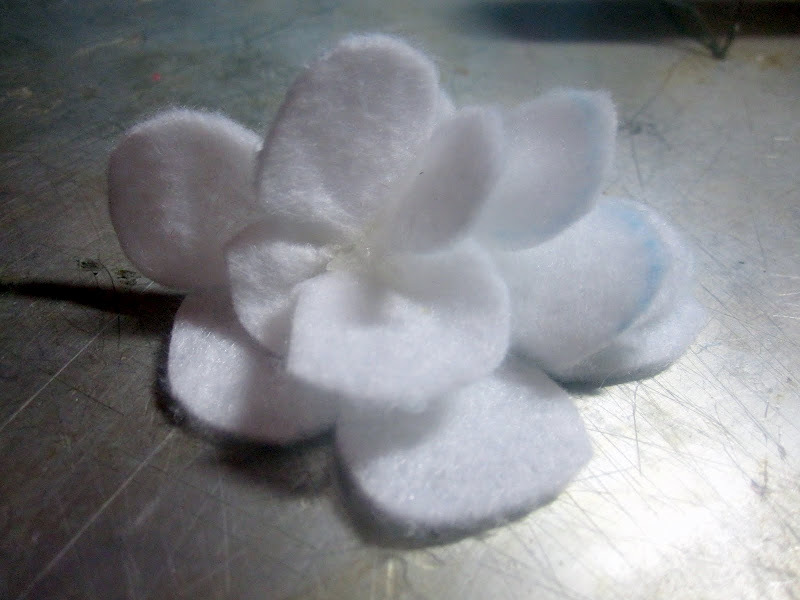 The only flower I did that doesn’t use felt. 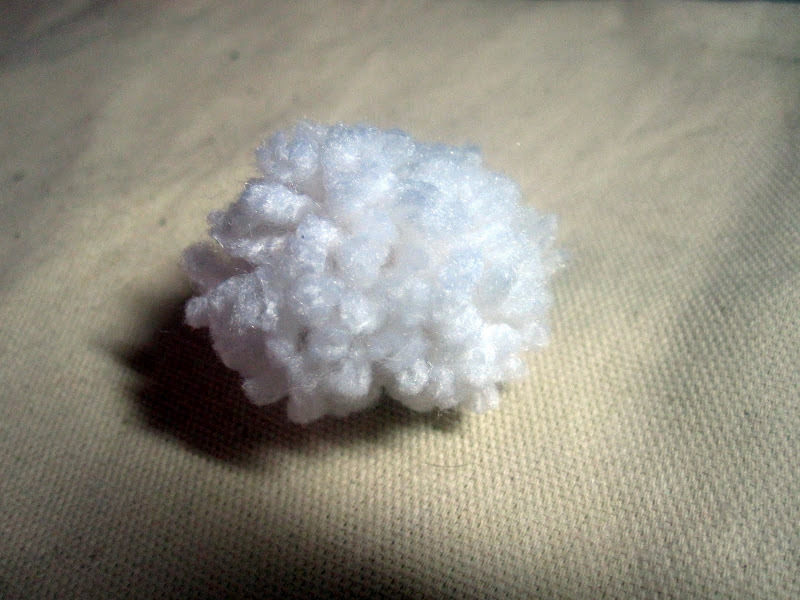 This is done by simply making Pom Poms with white yarn. 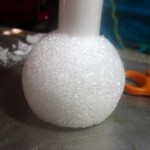 I used my Clover Pom Pom Maker to make mine. Better than me showing multiple pictures of the steps is this YouTube Video. This is a very simple felt Rose. I got the instructions from eHow.com. It just starts by drawing a circle on the felt and then drawing a spiral into the center. Those are the cut lines. 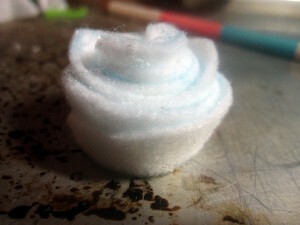 Once the spiral is cut out I started out the outside, glue gun in hand rolling the rose up and gluing as I went. These are another of my own thought and there isn’t much too them. 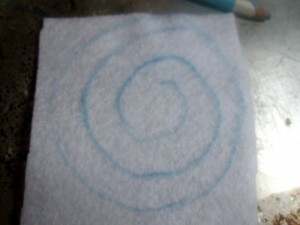 They are circles that I freehand drew and cut out. I then added a spot of glue and pressed the circle together to make four petals. The blue you see is the marking pencil. I actually liked how it looked so I didn’t try to remove it. 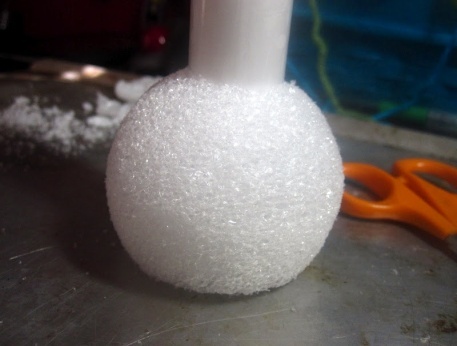 Now I just glued them to the Styrofoam ball as I thought looked nice. I could have fit more also. I think they look best when they are really tight together. 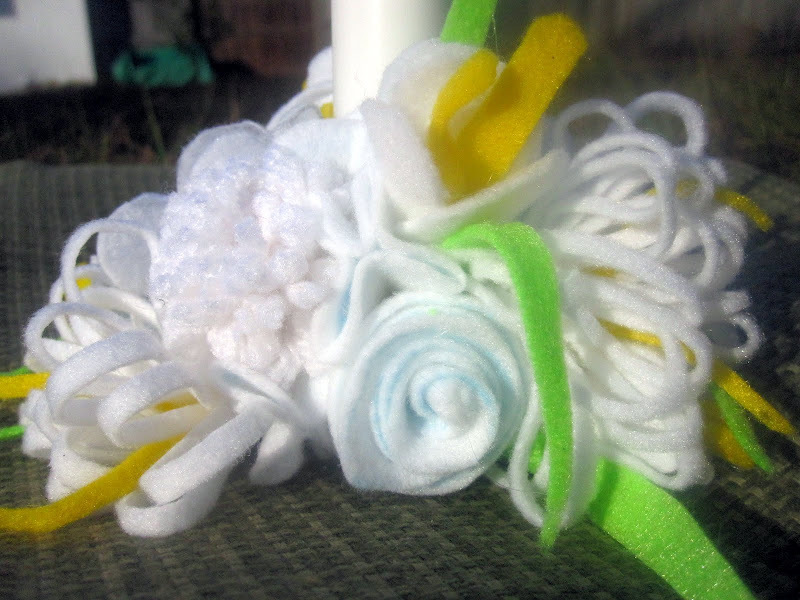 These flowers could be used on all sorts of items, from hair accessories, brooches, bags, wreaths or other home decorations. 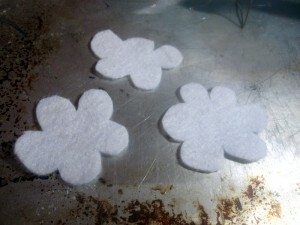 They’re simple, easy and a great craft for children who can confidently use scissors and/or hot glue. This could be done with regular craft glue but you would need to secure the flowers while they dry, rubber bands would do the trick. I’d love to see some of the final projects of others who make these. Let me know by joining into the Flickr group, or posting it to the Facebook Fan Page. 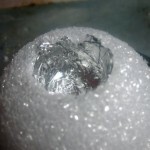 Please come back and check out my blog, Treegold and Beegold. I’m currently working on a cute little sheep tutorial I’ll be debuting soon.